President Rodrigo Duterte delivers his speech during the Partido Demokratiko Pilipino-Lakas ng Bayan campaign rally in Victorias City Sports and Amusement Center, Negros Occidental on March 8, 2019. MANILA, Philippines — President Rodrigo Duterte stressed that the Philippines could not afford to go to war with China, days after a US official assured him Washington would protect Manila if its forces are attacked in the disputed West Philippine (South China) Sea. 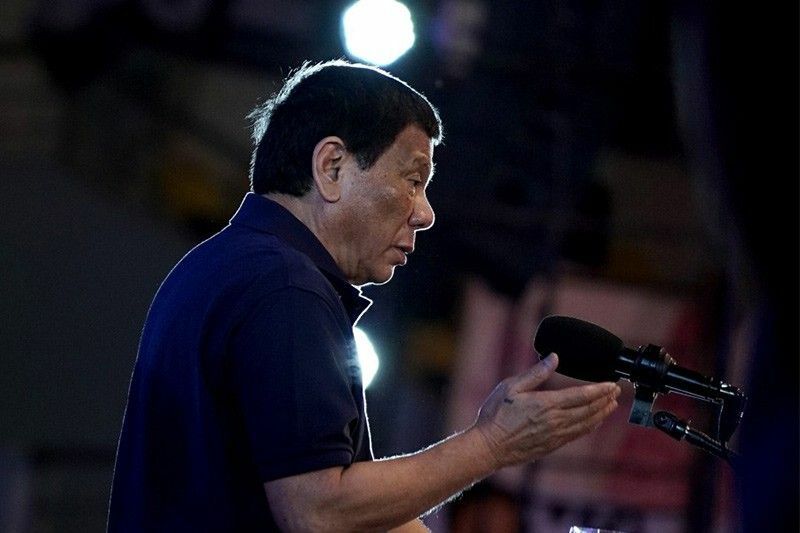 Duterte said an armed conflict with China would result in a "massacre" of Filipino troops because Beijing has "plenty of good quality weapons." "If we go to war against China, I would lose all my soldiers just as they are leaving for the war. It will be a massacre. We don’t have the capacity to fight them," the president said during the distribution of land ownership certificates in Negros Occidental last Friday. "Now that they are rich country, they have plenty of good quality weapons, and China has improved a lot because many jobs have been generated by the construction and the planning behind making China more beautiful. But for many years, they were ordered by their president to keep on creating guns," he added. Duterte said unlike China, which has the financial capability to invest in weapons, the Philippines' budget is being spent for education and teachers' wages. "They have money. They have weapons that we can’t compare ours with if we ever go to war. I would lose all of my police and soldiers in just one day. I’m not saying that I am scared. But what about my two wives and four girlfriends? They won’t have anything," he added. China, the Philippines, Vietnam, Malaysia, Brunei and Taiwan are embroiled in a dispute over the South China Sea, where an estimated $5 trillion worth of goods passes through every year. In 2013, the Philippines, whose military capability is one of the weakest in the region, challenged what it described as China's "exaggerated" maritime claims before an international court. A Hague-based arbitral tribunal voided China's claims in 2016 but the Chinese government refused to recognize the ruling, calling it "illegal since day one." Late last month, US State Secretary Mike Pompeo assured Duterte Washington is ready to fulfill its treaty obligations and to defend the Philippines if its troops are attacked in the South China Sea. Duterte has welcomed the assurance but has expressed reservations on the processes that require the nod of America's Congress. He noted that the US government has to secure the approval of its Congress before it can declare war.